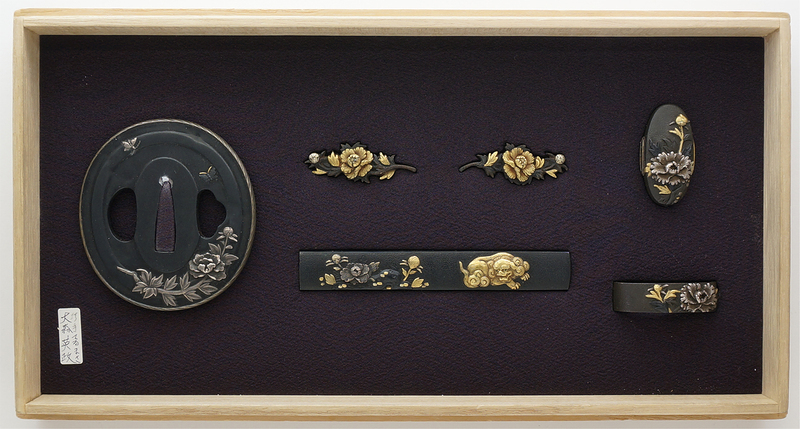 A set of toso-gu: Tsuba, a pair of menuki, kozuka and a pair of fuchikashira. Design of Botan-Frower and Shishi-dog zu. Round backish iron plate　with silver color has Botan Flower and Butterfly in front and the moon, mountain and river, Bat in back. Botan-Frower　represented with taka-bori on the shakudo-nanako plate, colored with gold and silver iroe. Botan-Frower　and Shishi-dog are represented with taka-bori on the shakudo-nanako plate, colored with gold and silver iroe. Terumasa is Tokuno family and his signature engraved as Omori. He estimated 'Umate' (good maker). Edo ju. Fuchi Length: 3.71 cm x 2.10cm x 0.99cm. Kashira Length: 3.55 cm x 1.84cm x 0.78cm. Botan Flower engraved on the plate made of shibuichi silver or Shakudo and colored with gold and silver color.